BALTIMORE, MD. 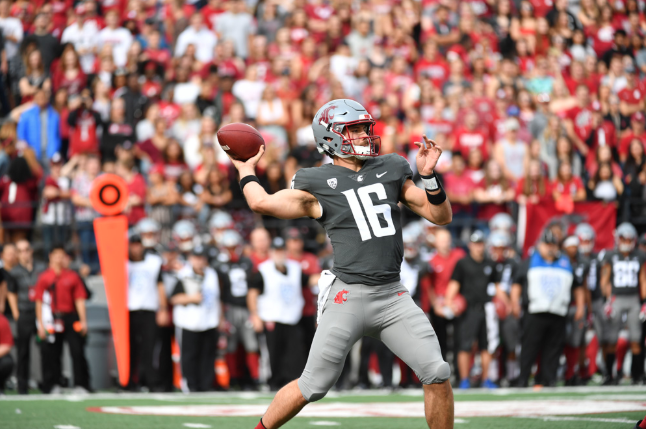 (December 4, 2018) – Washington State University quarterback Gardner Minshew, II has won the 2018 Johnny Unitas Golden Arm Award® Presented by A. O. Smith. The prestigious award is given annually to the nation’s top quarterback who best exemplifies character, scholastic and athletic achievement. Minshew has completed 433 of 613 passes for a total of 4,477 yards (71% completion rate), throwing for 36 touchdowns with just nine interceptions and a QB rating of 148.4. Minshew has endeared himself to Cougar fans across the country, not only because of the “Minshew Mustache”, but his penchant for late game heroics. He has led WSU on game-winning, fourth quarter drives against Utah, Stanford and California. In the fourth quarter this season, Minshew has completed 92 of 127 passes (72% completion rate) for 1,169 yards, 13 touchdowns and no interceptions. The Johnny Unitas Golden Arm Award® Presented by A. O. Smith has been presented at the end of each college football season since 1987. Candidates must be college seniors or fourth-year juniors on schedule to graduate with their class. In addition to accomplishments on the field, candidates are judged on their character, citizenship, scholastic achievement, team work and leadership qualities. Minshew’s achievements will be honored on Friday, December 7, in Baltimore, MD. The Johnny Unitas Golden Arm Educational Foundation, Inc. and A. O. Smith are happy to be returning to the Embassy Suites Baltimore Inner Harbor Hotel and Grand Historic Venue. Former NFL quarterback and 2010 Golden Arm Award recipient, Scott Tolzien, will deliver the keynote remarks at this year’s event. Past standout winners of the Johnny Unitas Golden Arm Award® Presented by A. O. Smith include: Peyton Manning (Tennessee, 1997); Carson Palmer (USC, 2002); Eli Manning (Ole Miss, 2003); Brady Quinn (Notre Dame, 2006); Matt Ryan (Boston College, 2007); Colt McCoy (Texas, 2009), Andrew Luck (Stanford, 2011), Marcus Mariota (Oregon, 2014) Connor Cook (Michigan State, 2015) Deshaun Watson (Clemson, 2016) and last year’s winner Mason Rudolph (Oklahoma State 2017). Other sponsors of the Golden Arm Award Presented by A. O. Smith Corporation include: MedStar Sports Medicine, The Babe Ruth Museum, Cannonball Moments, Century Engineering, CoForce, Comcast, Dunbar Guard Service, Dunbar Security Systems, The Embassy Suites Baltimore Inner Harbor & The Grand, Haddock Investments, Harvey Agency, HMS Insurance Associates, Inc., MedStar Sports Medicine, Milwaukee Tool, PSAV, Panini, TRAY, The Scott Garceau Show, SILKS, Wilson Sporting Goods, Wolf Professional Security and ZBest Executive & Global Transportation Services. A. O. Smith Corporation is a leading global manufacturer and marketer of residential and commercial water heaters as well as water treatment products. A. O. Smith offers its customers an additional competitive advantage in that the company designs, builds, distributes and supports the world’s broadest and deepest line of residential and commercial water heaters, commercial boilers, and water treatment products. This single source concept simplifies ordering, installation and service and is backed by 80 years of research and innovation. For the most up-to-date news, like A. O. Smith on Facebook, follow on Twitter and visit http://www.hotwater.com/. To learn more about the Golden Arm Award, please visit: Golden Arm Foundation or Golden Arm Award. Additionally, please follow the conversation throughout the season on Twitter, Instagram and Facebook and use the hashtags #GoldenArmAward and #InnovationLeaders. A. O. Smith reserves the right to make product changes or improvements at any time without notice.